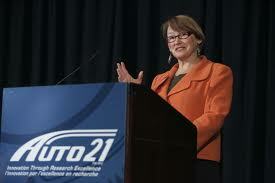 Suzanne Fortier has been reappointed for a second 5-years term as President of the Natural Sciences and Engineering Research Council of Canada (NSERC). We wish her well. The first term of Dr. Fortier was marked by an abrupt change of government and therefore of style in dealing with traditionally independent government agencies. Remember Statistics Canada? We now have a minister for Science and Technology, Gary Goodyear, who seems to be very engaged in the research and innovation agenda. Gone are the days when Tri-council presidents complained about not being able to secure a meeting with a Deputy Minister, let alone the Minister himself. Kudos to Goodyear and Clement for changing all that. On the other hand, too much political interference in science policy and funding, especially with the Tri-council, is a double-edged sword. First, there were the issues of funding. The government has, of course, the responsibility to make such decisions, but we can all agree that cutting the Tri-Council in a stimulus budget had to be noticed … even by the Presidents of the three councils. The last time I spoke to Suzanne, she argued that –while we were making a fuss– government funding for research was actually increasing. It all, of course, depends on how and what you count. We agreed to differ. She may end up being right if you accept her views about the extent of research targeting that government is entitled to. But let’s focus for now on one problem. Billions of dollars of government funding are being funneled –via a myriad of agencies and organizations– towards R&D in targeted areas: Aerospace and Defence, Automotive industry, Forestry, Genomics, Biotechnology, Agriculture, Nanotechnology, Fuel cells, Clean energy, etc, etc…and I am not talking about the 4 billion dollars worth of tax cut incentives going towards the so-called Scientific Research and Experimental Development Tax Credit program. On the other hand, there is a tiny fraction of that amount that goes to basic scientific research, as exemplified by the Discovery Grant Program. There are numerous examples on how this so-called curiosity-driven research has been fundamental to the advancement of our knowledge and our standards of living. Yet, it has been so hard to explain. But then, why should we be surprised that public officials, policy makers and their staff could never think of targeting funds towards “Lie Theory”, “Humming Birds”, or –in a different era– “Electricity”? My impression is that government is starting to get it. Thanks to major interventions by University Presidents, the AUCC, what’s happening south of the border, not withstanding a little help from front-line researchers. In the last federal budget, NSERC received 13 millions (~2.5% increase), 5 millions of which is earmarked for “Partnerships and Innovation”. What is important here is that this provides NSERC with an $8M “room” to support advanced basic research, embodied by the Discovery Grant program. NSERC’s decision on what to do with this increase was supposed to be made last summer. Yes, a relatively tiny amount, but how symbolic it is! The government is undeniably recognizing that Canada’s basic researchers are major performers on the world stage, and that scientific excellence is another podium we need to own. We hope that Suzanne will make this a priority for her second term.